The Status Report screen provides a quick overview of the current status of all the domains that you’ve created (or have access to) based on the most recent verification. 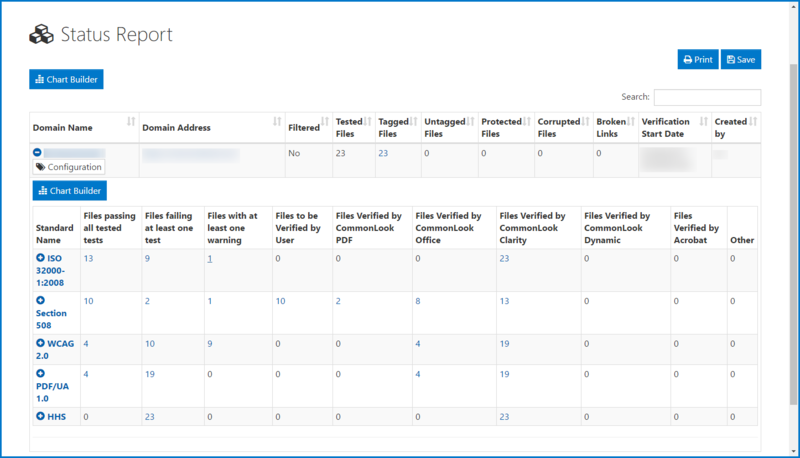 When you open this report screen, a table will provide Domain specific information about the files in that domain, when it was verified, and who created it. Select a domain’s name (in the left column of the table) to open a second table. The second table provides more specific verification information, by standard, including the number of files that passed tests, failed tests, and have warnings. Also, Commonlook will note how many PDFs have been verified with Clarity, another CommonLook product (PDF, Office, or Dynamic), or Adobe Acrobat. Also on the report screen is a Chart Builder button. Choose this button and input the requested information to create either a line chart or a bar chart which will graphically display the data as provided in the tables.